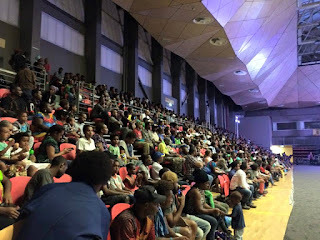 Gospel group Covenant Creed’s back to school concert was a hit for youths who turned up in numbers at a packed to capacity Sir John Guise Indoor Complex in Port Moresby on the weekend. The gospel group Covenant Creed Ministries International’s Back to School Jam is an annual event initiated in 2017 and Saturday’s concert was the second year running. The concert is a platform created for school students, youths and young children of our city to attend and enjoy a night of positive and inspirational gospel music to kick start the new school year. The organizers said their focus is to provide a platform for the next generation to congregate, be inspired and be motivated through their ministry of praise and worship which they believe will then usher them onto the right path in life’s journey. The Concert was also the launching of a brand new Volume 2 album titled POSSIBILITIES which is already on sale. You can grab a copy of the album for K55 only from the Dorcas Christian Gift House at Vision City and K50 at the CLC Bookshop at Boroko. The album is also on ITunes.